Web analytics is the measurement and analysis of website visitor data for the purpose of understanding and optimizing web usage. Web analytics for CMS sites is provided through Urchin Analytics, a web-based software. Urchin tracks web traffic and provides reports to help you better organize and update web content. Request access to use Urchin. An alternate web analytics service is Google Analytics. While Google Analytics is not provided through the university and support is not provided to help you understand the data, you may set it up using the instructions for Site-Wide Scripts. Reports display once a profile (site) is selected in the interface. Use the information below to locate the report you want to use then apply a date range. Tip: When logged into Urchin, click About this Report in Help Resources for more information about a particular report. High or low traffic trends; provided as sessions, page views, hits, etc. Number of visitors, sessions, unique visitors, etc. Visitor paths through your site including entrance and exit pages, bounce rates, etc. Network visitors are using when they visit your site. Top web browsers or robots that were used to visit your site. Visitors’ computer information such as screen resolution, languages, java enabled, time zone, etc. Follow the steps below to apply a date range for the selected report. Select Enter Range (calendar icon). 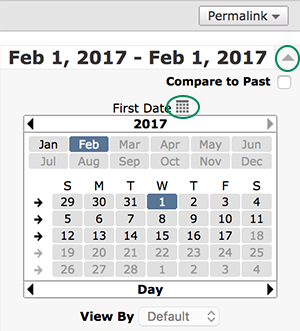 Select a starting date from the first calendar. Select an end date from the second calendar.